2.Tail Knot: Double Sheet Bend. 3.Color: Blut and Grey / Green and Red. 4.Size: 300*200cm (118 x 79 in) support up to 500lbs. 5.Accessories: 2 x Aerial aluminum carabiners,2 x Durable straps(118"long). The hammock is made of super strong 210T parachute nylon material. So it's very lightweight. This soft, breathable and mildew-resistant nylon cloth will last for a long lifetime. We have employed high-grade nylon triple interlocked stitches to maximize hammock strength for your ultimate safety. So the hammock are tested to hold up to 500lbs. It takes less than 3 minutes to hang your camping hammock on a tree or nearby objects using the ropes, strips and carabiners. Machine wash after every time use and it always stay in its vivid color. The two free durable carabiners are made of aerial material 7075 aluminum with laser printing logo.The hammock is made out of rigorous process,and has delicate sewing. 1.Use it as a hammock, sleep in it, read books, play with your pets. 3.Use it as a picnic blanket/beach blanket. It can be laid on the grassland,enjoy great time with your family and friends. 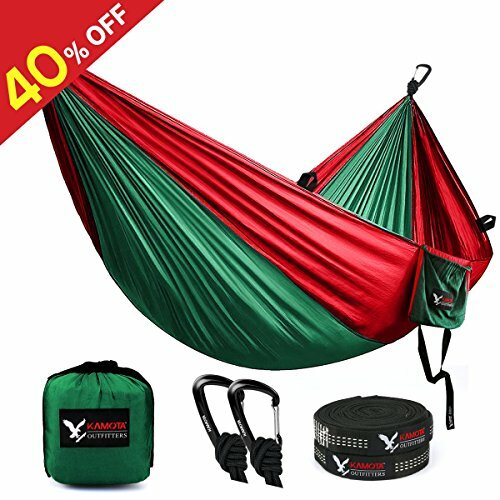 PROFESSINAL OUTDOOR HAMMOCK - Coming with 1x camping hammock (118"long x 79"wide), 2 x easy-setup durable straps(118"long), 2 x solid aerial aluminum carabiners.Special designed 2 strap holes on each side makes it convenient to hold your food, water bottles and backpacks as well.It's easy to clean and stays the bring color after machine wash. EXTRA LARGE SIZE - Comfortably support up to 500 lbs and fits 2 people.you can lay down with your friend or loved one and you will still have plenty of room. Because of the new 210T nylon parachute fabric, this double hammock provide relaxing support up to 500 lbs. Luxuriously sized, measuring 300 x 200cm (118 x 79 in). STUFF IT IN A SACK & FAST & EASY SETUP - Stuff sack is conveniently sewn right into the hammock so you never lose it. Just stuff the lightweight hammock into the small attached sack, put it in your pack and off you go to anywhere.When you find a best spot, it will takes 2-3 minutes to set up this camping hammock by using the tree straps and steel carabiners. IDEAL FOR MULTIPLE USES - Perfect for traveling, camping, hiking, backpacking, beach, boat trip, road trips, general exploration, or just napping, sleeping, dreaming and relaxing in the patio, balcony, garden, or backyard. Great gift for adults, kids, people who travel, beach goers, tent campers and hikers. Also, it could be used for yogi to practice aerial yoga in fitness club. 100% MONEY BACK GUARANTEE & NO RISK SHOPPING: ESARORA offer 45 Days Money Back & Lifetime Guarantee and Friendly, Easy-to-reach Support. Please Choose ESARORA Direct. If you have any questions about this product by KAMOTA, contact us by completing and submitting the form below. If you are looking for a specif part number, please include it with your message.